By: Punyaratabandhu, T., Lohwongwatana B., Puncreobutr, C., Kosiyatrakul, A., Veerapan, P. and Luenam S. 2017. 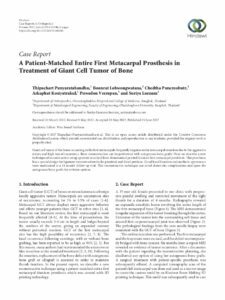 Abstract: Giant cell tumor of the bones occurring in the first metacarpals frequently requires entire metacarpal resection due to the aggressive nature and high rate of recurrence. Bone reconstruction can be performed with autogenous bone grafts. Here we describe a new technique of reconstruction using a patient-matched three-dimensional printed titanium first metacarpal prosthesis. This prosthesis has a special design for ligament reconstruction in the proximal and distal portions. Good hand function and aesthetic appearance were maintained at a 24-month follow-up visit. This reconstructive technique can avoid donor-site complications and spare the autogenous bone grafts for revision options.